A ladybug larva sinks its jaws into a juicy rose aphid. Last week we visited the awesome realm of female aphids multiplying seemingly without bounds on mums and roses. As the ladies sipped sap, they produced copious amounts of the sweet sticky liquid called honeydew. The odors of the honeydew and smells emanating from the plant provide an airborne signal to aphid hunters - ladybugs, flower flies, and parasitic wasps. To these natural born killers, the aroma is like a dinner bell ringing come and get it. This Asian multicolored ladybug will turn plump, juicy aphids into dozens of beetle eggs. Among the joyful lady aphids, alligator-like lady beetle larvae consume dozens of aphids each day. 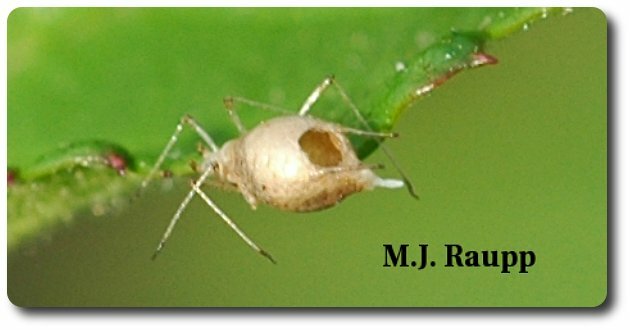 These somewhat clumsy hunters wander randomly on the surface of leaves or stems until they contact a cluster of aphids. Once they find the victims, a series of tight turns left and right keep them in the patch of aphid prey until their hunger is slacked or the aphids run out. 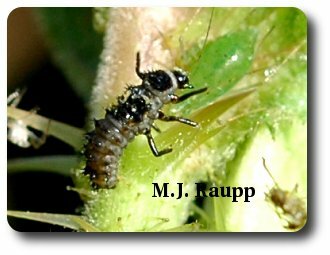 Over a period of about two weeks these larvae grow and complete development, killing hundreds of aphids in the process. When their juvenile days are over, they pupate and emerge as the beautiful ladybugs we know and enjoy. Adult ladybugs continue the aphid carnage. The protein found in the aphid feast will be turned into beetle eggs within the body of the female. 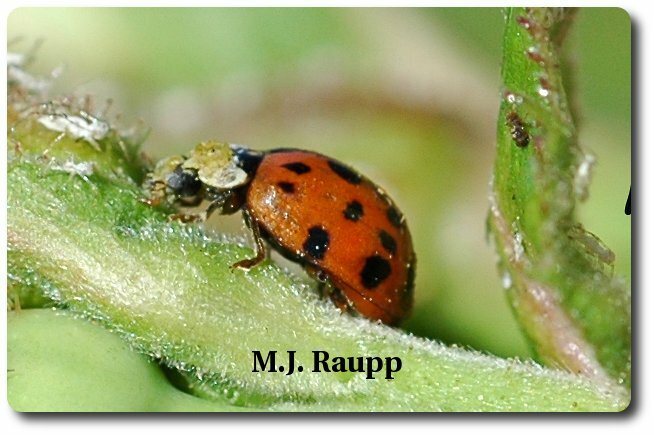 Eggs are laid on the plant where they hatch and another generation of ladybug larvae visit despair on the pesky aphids. Flower flies don't sting but they mimic bees and wasps to gain protection from their own predators. A second group of predators drawn to the wonderful odors of the aphid colony are flower flies. These magnificent creatures are also known as hover flies or syrphids. Female flower flies locate aphids and lay a small white egg nearby. The egg hatches into a gelatinous, wriggling, maggot whose sole purpose is to hunt and eat aphids. How this mass murderer stalks, captures, and consumes so many aphids is a wonder. After doing time as a maggot, the flower fly larva pupates and later emerges as a fly. 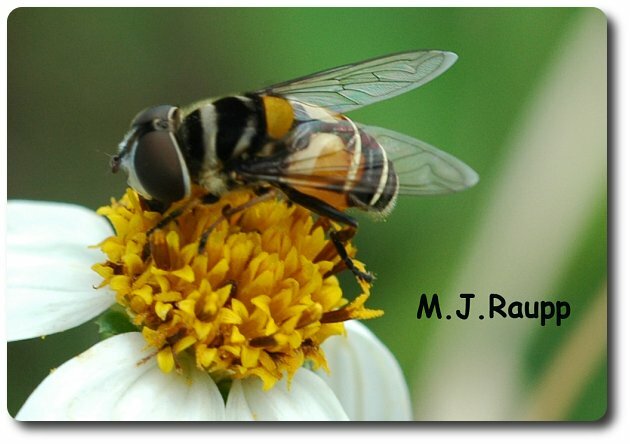 Flower flies know exactly where to lay eggs to ensure a meal for their young. This brown aphid mummy has a parasitic wasp inside. Flower fly maggots may consume more than 1000 aphids during development. One more group of aphid killers made their presence known this week. These are the parasitic wasps. While observing the aphid colony, two distinctly different types of aphids were seen. Some were plump, juicy, mobile aphids of green or pink. Others were strange, motionless, papery aphids light brown or tan in color. These papery aphids are called aphid mummies because of their brown parchment-like skin. Tiny parasitic wasps attacked aphid mummies. A female wasp inserted an egg through the skin of each aphid. Eggs hatched into wasp larvae that ate the internal organs of the aphid killing it in its tracks. 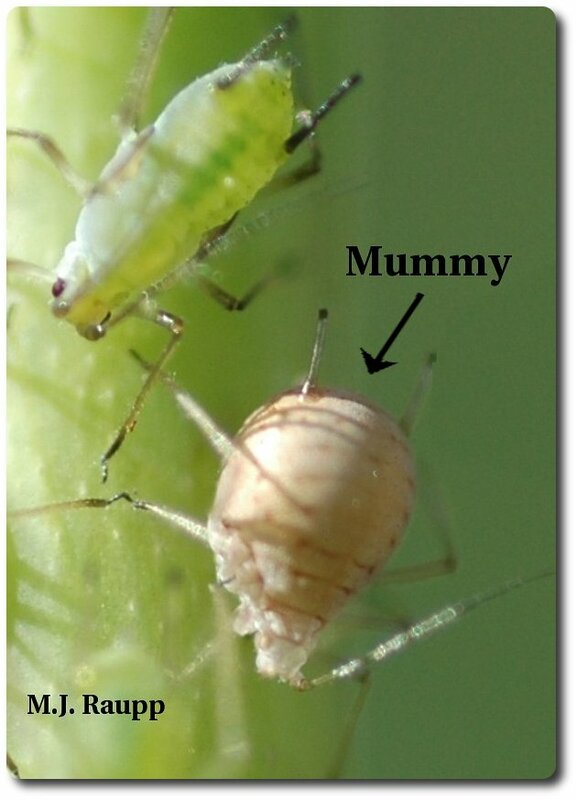 This process caused the aphid to change from its normal color of green or pink to the telltale brown of the aphid mummy. After devouring the aphid from within the small wasp pupates in the papery shell. From the pupa emerges the wasp that chews a hole in the abdomen of the aphid, pops out, and searches for another aphid victim to sting and insert her egg, thereby completing the circle of life. The hole in this aphid mummy was made when a lethal parasitic wasp emerged. Each female wasp can kill dozens to hundreds of aphids by laying eggs or by piercing the aphid to drink its blood for food. If you have colonies of aphids on your roses or trees, don?t reach for the bug spray until you carefully inspect your plants. You see, aphids are Mother Nature's factory for beneficial insects like lady beetles, flower flies, and parasitic wasps that help control many of the pests found in your landscape and garden. Enjoy these beneficial bugs. Watching ladybugs and aphid mummies appear while aphids disappear is wicked good fun. Many of the aphid killers in this bug of the week can be purchased from commercial suppliers and released in your garden or greenhouse to help control aphids.